The picture, by the greatest artist of eighteenth-century Rome, was painted for Sir Humphrey Morice (1723–1785), son of a wealthy merchant and director of the Bank of England. 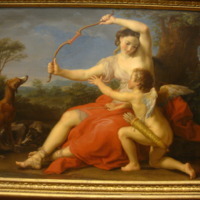 Morice was a great animal lover and in 1762 commissioned from Batoni a portrait of himself reclining in the Roman countryside after the hunt as a pendant to this picture, which shows the goddess of the hunt witholding the bow from Cupid. The picture was considered the finest Batoni had ever painted. The figure of Diana is based on the celebrated ancient statue of the sleeping Ariadne in the Vatican, which Batoni has invested with extraordinary warmth and feeling. Pompeo Batoni (Italian, Lucca 1708–1787 Rome) , “Diana and Cupid,” Mapping Mythology: A Digital Collection of Classical Mythology in Post-Antique Art, accessed April 22, 2019, http://mappingmythology.com/items/show/61.